Despite playing a man down for almost three-quarters of the game Tuesday night, the Coupeville High School boys soccer squad came within a shot or two of upending perennial power King’s. But, missing their #2 scorer, junior team captain Aram Leyva, who was given a red card after a scrum, the Wolves fell 2-1 on their home turf. The loss drops Coupeville to 0-1 in North Sound Conference play, 2-3 overall. If the red card, which was levied in the game’s 22nd minute, is upheld, Aram Leyva will have to sit out his team’s next game, Friday night at home against Sultan. Coupeville, coming off a big road win Saturday at Nooksack Valley, drew first blood in its league opener. Barely two minutes into the game, Derek Leyva bounced a ball over the diving King’s goaltender to put his squad up 1-0. “Great goal from Derek,” said CHS assistant coach Robert Wood. “Unassisted, moving right to left on top of the 18, a bouncing shot the keeper couldn’t handle. 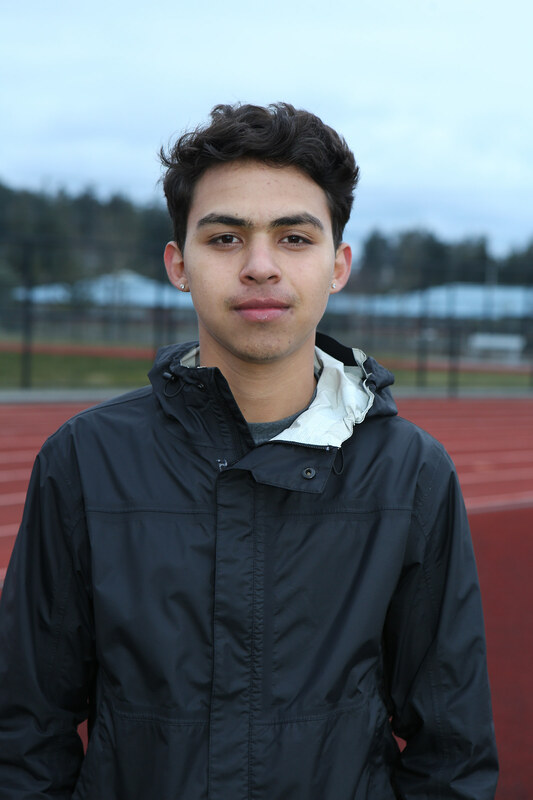 The seventh goal of the season for Derek Leyva, it gives him 31 for his Coupeville prep career, but the score was also a bigger milestone. When the ball hit the back of the net, it was the 100th goal scored at CHS by a Leyva, with Derek’s tally added to the 45 and 24, respectively, of his cousins, brothers Abraham and Aram. King’s fought back, literally, with its big bruiser “barreling through our players” while knocking in a header off of a corner kick in the 12th minute. The Knights added to their rally, taking the lead on a give-and-go play, in which their striker, who Wood favorably compared to Will Bruin of the Sounders, slapped a shot just to the side of Coupeville goalie Dewitt Cole. Coupeville played the final 18 minutes of the first half, and the entire 40-minute second half down a player, but its defense held up magnificently. Cole and his back-line mates stood tall, while the Wolves continued to push the ball on King’s side of the field. Derek Leyva, Teo Keilwitz, and Sage Downes brought the heat up front, but, despite their best efforts, the tying goal would not find its way into the net. While they wanted a win, Coupeville’s coaches departed the pitch pleased with much of what they saw. “All heart playing a man down for 60 minutes,” Wood said. “All strength from the back line. All focus from the mids and forwards. Tuesday’s game kicked off a four-game run of league games for the Wolves. After Friday’s home tilt with the Turks (0-0, 0-4), Coupeville hits the road for games at Cedar Park Christian (Mar. 26) and South Whidbey (Mar. 29).